View More In Tracheostomy Care Kits. Item #: 6842201. Packaged in triple-stacked, one-compartment tray with peel-back lid. 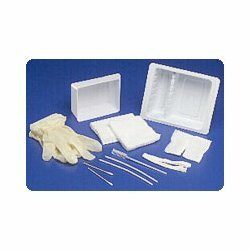 Two-compartment, removable basin includes one 6" trach brush, drape, two SAFESKIN Purple Nitrile gloves and four 4" x4" gauze sponges. Sold individually.